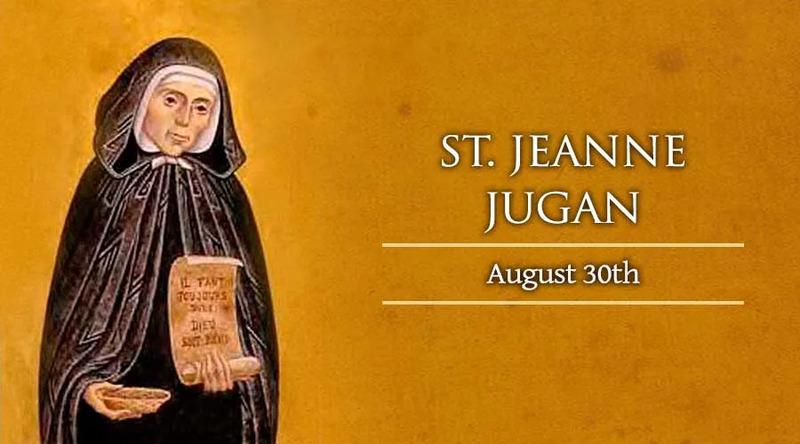 On Aug. 30, the Catholic Church celebrates Saint Jeanne Jugan, also known as Sister Mary of the Cross. During the 19th century, she founded the Little Sisters of the Poor with the goal of imitating Christ's humility through service to elderly people in need. Born on Oct. 25, 1792 in a port city of the French region of Brittany, Jeanne Jugan grew up during the political and religious upheavals of the French Revolution. Four years after she was born, her father was lost at sea. Her mother struggled to provide for Jeanne and her three siblings, while also providing them secretly with religious instruction amid the anti-Catholic persecutions of the day. At age 25, the young woman joined the Third Order of St. John Eudes, a religious association for laypersons founded during the 17th century. Jeanne worked as a nurse in the town of Saint-Servan for six years, but had to leave her position due to health troubles. Afterward she worked for 12 years as the servant of a fellow member of the third order, until the woman's death in 1835. During 1839, a year of economic hardship in Saint-Servan, Jeanne was sharing an apartment with an older woman and an orphaned young lady. It was during the winter of this year that Jeanne encountered Anne Chauvin, an elderly woman who was blind, partially paralyzed, and had no one to care for her. Jeanne carried Anne home to her apartment and took her in from that day forward, letting the woman have her bed while Jeanne slept in the attic. She soon took in two more old women in need of help, and by 1841 she had rented a room to provide housing for a dozen elderly people. The following year, she acquired an unused convent building that could house 40 of them. During the 1840s, many other young women joined Jeanne in her mission of service to the elderly poor. By begging in the streets, the foundress was able to establish four more homes for their beneficiaries by the end of the decade. By 1850, over 100 women had joined the congregation that had become known as the Little Sisters of the Poor. However, Jeanne Jugan – known in religious life as Sister Mary of the Cross – had been forced out of her leadership role by Father Auguste Le Pailleur, the priest who had been appointed superior general of the congregation. In an apparent effort to suppress her true role as foundress, the superior general ordered her into retirement and a life of obscurity for 27 years. During these years, she served the order through her prayers and by accepting the trial permitted by God. At the time of her death on Aug. 29, 1879, she was not known to have founded the order, which by then had 2,400 members serving internationally. Fr. Le Pailleur, however, was eventually investigated and disciplined, and St. Jeanne Jugan came to be acknowledged as their foundress.